The Ndebeles are an ethnic group in southern Africa that are particularly popular for their artwork. They are also known as the Amandebele, Matabele, Ndzundza Ndebele and so on. The Ndebeles can be categorized into three main groups; the Southern Transvaal Ndebele (now Gauteng and Mpumalanga), The Northern Transvaal Ndebele (now Limpopo Province), and the Ndebele people of Zimbabwe, who were called the Matabele by the British colonials. There are many legends regarding the origin of the Ndebeles of southern Africa. They are part of a larger ethnic group called the Nguni in southern Africa and speak the isiNdebele language. The Transvaal and Zimbabwean groups, however, speak slightly different languages due to being separated geographically and adopting similar languages to their new neighbours. For example, Zimbabwean Ndebeles would refer to the month of July as uNtulikazi while their Transvaal (South African) counterparts refer to it as uVelabahlinze. The Ndebeles in South Africa can be categorized as the Southern Transvaal and the Northern Transvaal. These groups like all Ndebeles originated from the Ngunis. They are Bantu-speaking and live primarily in Limpopo and Mpumalanga provinces. They trace their history to King Musi, a descendant of King Ndebele who made the son (Ndzundza) of his second wife King while he was still alive instead of giving it to the first son(Manala) from the Great wife. The Ndebeles of Zimbabwe primary live in the western region of Bulawayo, Zimbabwe’s second-largest city. It is believed that this group was formed when an Nguni military commander, Mzilikazi had contentions with Shaka, King of Zulu. The result of the conflicts saw him flee to present-day Lesotho and ultimately settling in Matabeleland– what the British called present-day Zimbabwe. 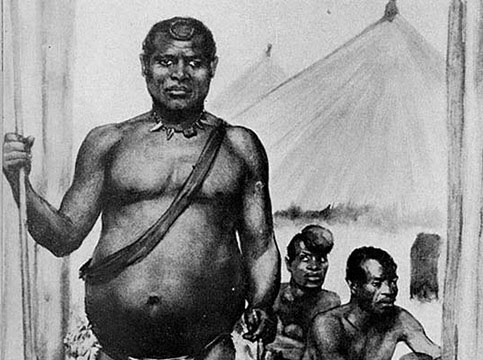 The Zimbabwean Ndebeles were ruled by Mzilikazi and then by his son, the popular King Lobengula. As mentioned earlier, the Ndebele tribe consists of those in the Northern Province, the Southern Transvaal Ndebele and the Ndebele people of Zimbabwe, who were called the Matabele by the British colonials. The history of the entirety on the Ndebele tribe can be traced back to Mafana who is recognized as their first chief. The war in 1883 which broke out during the reign of the Ndebele chief Mabhogo and lasted for eight months, left the cohesive tribal structure broken after Mabhogo’s defeat. Their tribal lands were confiscated but the people managed to hold on to their rich cultural heritage. There exist similarities between the Ndeele authority structures and those of their Zulu cousins. A tribal head, called ikozi, was vested with the authority over a tribe and was assisted by a family council referred to as amaphakathi. Next to them were the wards izilindi, looked over by ward heads and the family groups within the wards were in turn governed by the heads of the families. Umuzi is the name used to refer to the residential unit of each family and they consisted of the family head, his wife and all unmarried children. Sometimes, the family head would have two wives and the umuzi was divided into two halves, a right and a left half, to accommodate the different wives. The umuzi could expand to a more complex structure when the sons of the head married and their families then joined the umuzi. 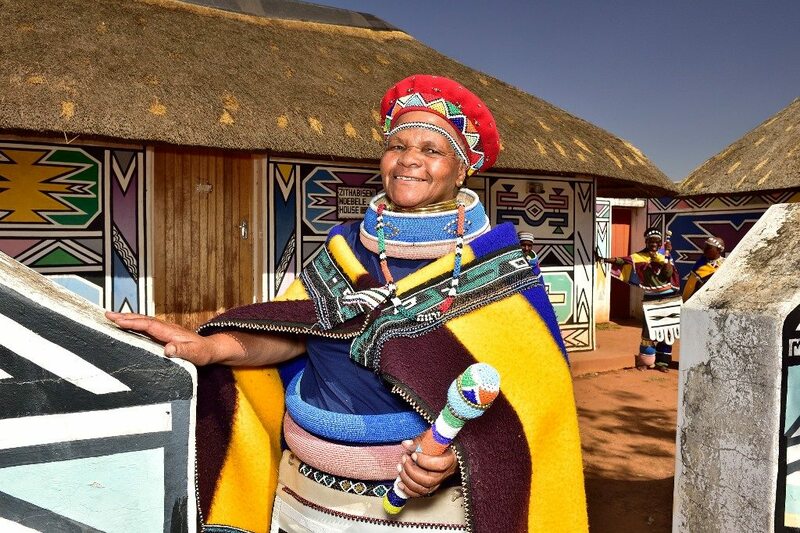 The Northern Province Ndebele people which are made up mainly of the BagaLanga and the BagaSeleka tribes adopted the language and culture of their Sotho neighbours. The Southern Transvaal Ndebele people speak the isiNdebele language. The Ndebeles are popular for their house paintings which are precise and perfectly done. This form of artwork is said to have begun in the aftermath of the Boer war, which saw the Dutch-speaking settlers win. They were forced into oppression and slavery and learned to use the painting as a way to communicate with each other. Different painting patterns, as well as colours, are said to have varied meanings. The Boers saw it as a decorative art instead of a secret way of communicating and therefore allowed it to foster. These paintings were primarily carried out by women and passed on to their daughters. The paintings which featured straight edges and symmetry were done by hand without the help of rulers and squares. The Ndebele women are also known for making sculpted figurines, pottery, beadwork, woven mat, and so on. Esther Mahlangu a Ndebele was commissioned to paint her designs on BMW’s and South African Airways’ jets. The Ndebele paintings may be colourful but so is their dressing. Ndebele women have been known to adorn themselves with a variety of ornaments that symbolize their status in society. They wore copper and brass rings around arms, legs and necks to symbolize the bond to their husband once their home was built. These rings were said to be provided by their husbands and the rings supposedly had ritual powers. The rings are still an ornament of the Ndebele people these days but they ar no longer expected to have permanence on the woman’s body. Another symbolic attire for the Ndebele women was the five-fingered apron (called an ijogolo). The ijogolo could only be worn after the women gave birth to a first child. A marriage blanket called nguba was also decorated with beadwork to record significant events throughout the woman’s lifetime.